Cadillac launched its new logo design at the 2014 North American International Auto Show (NAIAS), the first new logo in 14 years. They dropped the “crest” as it had “become dated.” The new logo is describe by Cadillac as having a “jewel-like” quality to it and a sleeker, more modern edge to it. Not only is it an excellent logo design, the manner in which it was launched was also superb. The new Cadillac logo was launched with appropriate context and consistency. A changed logo should never be a surprise (think Gap, UC Berkeley, etc.) for its audience. No logo change should be an unveiling of the whiz-bang, gee-aren’t-we-clever “creative work” the brand team has been doing internally. 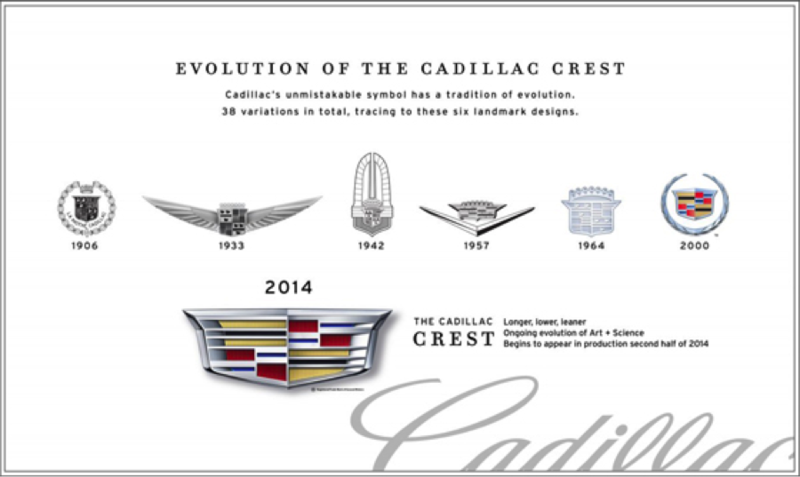 The image above puts the logo evolution in context and without saying word, shows the heritage and longevity of the Cadillac brand, which I suspect are key elements of the Cadillac brand attributes (a list every good brand manager has). So not only is the logo excellently executed to be familiar yet new, the launch of the logo to its audience is done with class, subtlety and genteel execution, all consistent with the Cadillac brand. Now THAT is how a logo should be launched, my friends. I predict this logo will be well received by the public, as opposed to some recent logo launches discussed above. Do as Cadillac did: Evolve naturally and launch in a manner that shows your brand attributes, and your new logo will be smoothly accepted.